A sun-weathered lawn chair sits at the Brewster-Bravo cemetery along the levee on Tuesday, Sept. 18, 2018, in San Juan. The construction of many roads and building developments across the country has been halted or diverted after crews discovered ancient burial grounds, usually holding the remains of Native Americans. Federal law protects such sites. But aren’t cemeteries that hold the remains of other historic residents just as sacred? Government workers and surveyors involved in the construction of the border wall might have to address that question — and perhaps the larger question about the archaeological value of land that has yet to be explored, but could be destroyed or rendered inaccessible when the wall is built. The Rio Grande Valley’s Military Highway that runs along southern Cameron and Hidalgo counties is so named for a reason: It was the main artery for troops and supplies serving the forts and towns that were built along the river. 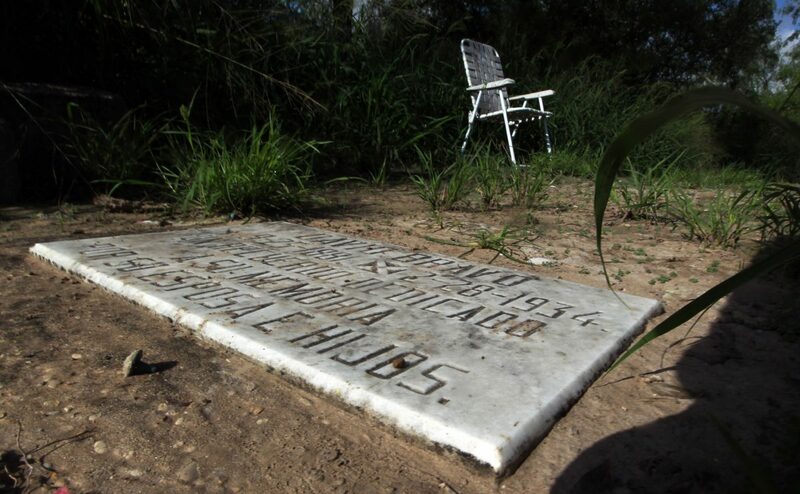 Cemeteries dot both sides of the highway, and some have even been designated as historic sites. Some of those sites lie in the path of the planned border wall, or in the no-man’s land between the wall and the Rio Grande. These cemeteries hold the remains of many of the pioneers who built the Valley, or who died defending it from encroachment by Mexican and American troops or marauders of all nationalities. Local sons who fought in the Civil War — both Union and Confederate — lie in some of these plots. More importantly, many of their descendants who still live here also plan to be buried there, in the old family plots. Much of the land surrounding the cemeteries has largely been undisturbed over the years. In fact, an astute hiker might come upon the remains of an old wagon or other artifact half-buried amid the shrubbery. Could those remains date back to more violent times, or are they more recent additions to the local landscape? Where along the Military Highway did skirmishes occur, between residents and bandits, Union and Rebel forces or troops and Juan Cortina and his loyalists? And might old Indian burial sites be found in the area as well? The forced removal of many indigenous tribes from Texas in the mid-1800s left the location of many such sites unknown. The area hasn’t received much archaeological attention, but that doesn’t mean the attention isn’t warranted. What historical treasures lying there could become unreachable once the wall is built? This country historically has recognized the value of such grounds and artifacts. Federal laws, such as the Native American Graves Protection and Repatriation Act and the Archaeological Resources Protection Act, preserve and protect them. In addition to the environmental surveys already being conducted, officials should conduct, or allow, archaeological surveys of the proposed border wall line. The distance from the wall to the actual border already creates problems for many property owners and wildlife sanctuaries. The possible historical damage the wall could cause is yet another reason the planning and placement of the wall — if it is built at all — should be as thorough as possible.